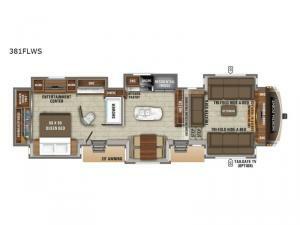 Your family will beg you to take vacation after vacation when you travel in this North Point fifth wheel! As you take in the sights and sounds of beautiful nature during the day, you will appreciate having a relaxing oasis to come home to each night with the private master suite that has a Simmons residential foam-top mattress in between two built-in nightstands, a walk-in closet, and a 32" LED TV on top of a full-size dresser. Not only is this unit full of exciting features, but it is also full of space thanks to the impressive six slides that have been included. These slides can be controlled by the One Control Digital Command system which allows you to extend each slide with the push of a button, and the central vacuum system allows you to keep your interior free from dirt and fallen food so that the bugs stay away all weekend long.